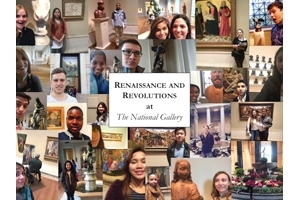 Professor April Shelford’s Renaissance and Revolutions class visited the National Gallery of Art (NGA) for two gallery assignments this spring. Renaissance and Revolutions is a course in the university’s General Education curriculum; it introduces students to European history from the Italian Renaissance to the French Revolution. In spring 2015, Shelford created new gallery assignments tailored to her lecture course that focus on the NGA’s permanent collections in Italian Renaissance and seventeenth- and eighteenth-century French art. As part of each assignment, students took photos at the museum. Seeing works of art from the periods students are studying makes history immediate and concrete in unforgettable ways. For example, students read the letters and journal of two Florentine merchant families to learn about the Italian Renaissance. After class discussion, the students went to the NGA for a museum scavenger hunt. They located ceramics and small sculptures that the people they’ve read about could purchase for their own homes, found the kind of portraits they could commission of themselves and their loved ones, and saw the sculpture they might encounter in their parish churches or the city’s cathedral. For the period leading up to the French Revolution, students located a bronze figurine of Louis XIV depicted as a Roman emperor; portraits of the hated mistress of Louis XV, the comtesse du Barry, and the equally controversial queen of Louis XVI, Marie-Antoinette; exquisite furnishings that graced the salons of aristocratic and wealthy bourgeois families; and genre paintings of the much humbler people who served them. Shelford encourages students not just to appreciate the beauty and craft of what they see, but to consider the paintings, sculpture, objets d’art, and furniture as social documents: What do they reveal about the values of people in the past? What image of him- or herself did the sitter for a portrait hope to project? What do these objects reveal about status, gender hierarchy, political power, religious piety? How can the historian use them as sources of information? Equally important, what do these visuals sources not reveal, because every source of information about the past encountered in the course—from journals to religious tracts, letters to plays—has its limitations. In-class discussion of these assignments generated great enthusiasm and Shelford plans to include the gallery assignments whenever she teaches Renaissance and Revolutions in the future. She’s delighted that her students learn so much about history from these assignments, and is even more pleased when a student that visited the museum for the first time tells her how much he or she enjoyed the experience—and plans to return.